Titan, the 60 metre superyacht built by Brooke Marine, is now for sale through Ocean Independence. Launched in 1968, Titan was originally a commissioned Royal Navy ship, HMS Beagle. But, after a rebuild completed in 2005 and a refit in 2008, the yacht is now for sale with an asking price of €26.9 million. The accommodation on board is impressive with 11 cabins, including the 90 square metre owner’s suite, plus six double and five twin cabins. 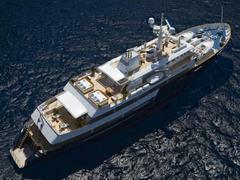 Currently in Genoa, Titan will appear at the Monaco Yacht Show.